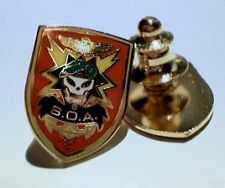 For the most part, the SOA is composed of U.S. Army Special Forces personnel but, also includes USAF Air Commandos/FAC's, Navy Seals, Marine Raider and Force Recon personnel and veterans of other elite military organizations who were an integral part of Special Operations. c. To commemorate fittingly the memory of those who have given their lives in defense of the Free World and to those who served in Special Operations units and are still unaccounted for as POW/MIA through the management of the SOA George C. Morton Memorial Scholarship Grant Fund. Since 1983, over $415,500 has been awarded or committed thus far to 130 deserving young scholars.